WOODEN STABLE FOR NATIVITY SET. 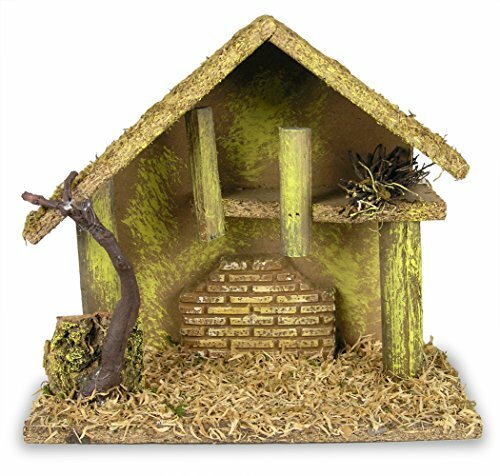 Beautiful moss covered barn or your collectible nativity figures (FIGURINES NOT INCLUDED). This medium sized creche would hold figures up to 4 1/2" tall. CHRISTMAS NATIVITY SCENE. Hand Made from weathered wood and moss materials to give it an "Old World" look. Great addition to any christmas centerpiece, christmas mantel decorations or window display. This indoor nativity creche will be a keepsake for your cherished set of the holy family for many years to come. NATIVITY STABLES. UNIQUE GIFT IDEA: give to mom, grandma, daughter, granddaughter, niece, nephew, son, grandson, sister or friend this Christmas holiday season to commemorate the birth of baby Jesus. CRECHE MANGER. This would be great to complete a children's nativity set. Just the right size for a smaller nativity scene. What a great way to celebrate the birth of JESUS. SIZE: 9"W x 3.75"D x 8"H, Fits figurines up to 4.5" Inch High DECORATIVE USES: display your scene on a fireplace mantel, book shelf, under the Christmas tree, tabletop centerpiece, window sill, etc.